BEGINNER AcroDance course on SUNDAY, 8:00PM @ Heliopolis branch! *** We offer Beginner AcroDance classes in HELIOPOLIS and NEW CAIRO branches. *Once the fee is paid, not refundable under any circumstances in future. As soon as the limit is reached, the registration will be closed. 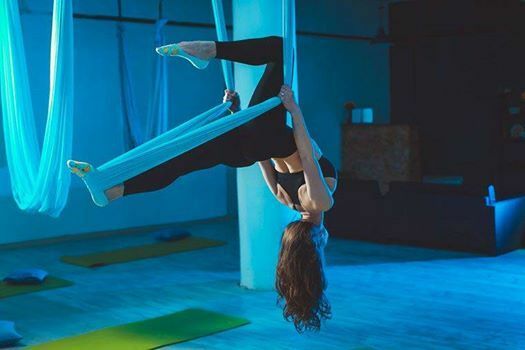 AcroDance program is a new Aerial Fitness trend created by Tania Bellucci. 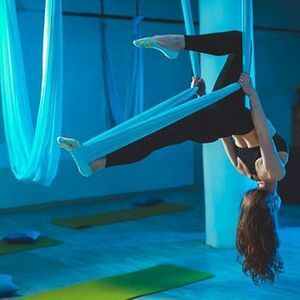 AcroDance program offers a new way of practicing Aerial art that allows the participant to experience a variety of acrobatic dance motions, tricks , drops, wraps, vertically, horizontally and fully inverted. AcroDance program is suitable for everybody, every age, every creative soul that doesn't feel like being bound by gravity today. Because you do all these mentioned above but while DANCING, Having FUN, minimizing the stress, will never feel boring, losing weight. Finally AcroDance is a real total Body workout!!! Comfortable workout clothes, barefoot or with supportive yoga shoes. Please do not wear clothing with zippers, buttons or anything that could potentially tear or snag the hammock material. Jewelry, including rings, bracelets, or earrings cannot be worn during class. You may wrap tape or a band-aid around your rings or pierced earrings before coming to class.